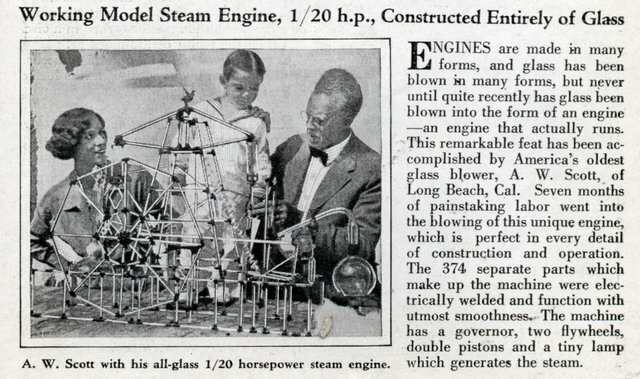 ENGINES are made in many forms, and glass has been blown in many forms, but never until quite recently has glass been blown into the form of an engine â€”an engine that actually runs. This remarkable feat has been accomplished by America’s oldest glass blower, A. W. Scott, of Long Beach, Cal. Seven months of painstaking labor went into the blowing of this unique engine, which is perfect in every detail of construction and operation. The 374 separate parts which make up the machine were electrically welded and function with utmost smoothness. The machine has a governor, two flywheels, double pistons and a tiny lamp which generates the steam.